Inside the Superman Fanboy Dilemma Part 3 is up at mtv.com, so here’s my third installment of Supes-themed Bronze Beauties. World’s Finest started in the 1940s as a Superman / Batman comic book with separate adventures of both heroes. 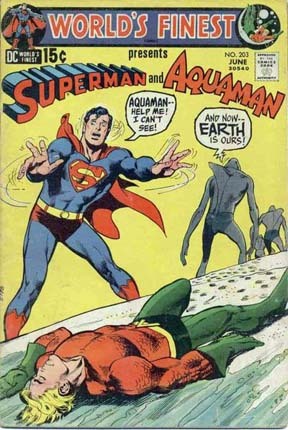 In the 1950s, it became a team-up book with the Man of Steel and the Gotham Guardian fighting crime together (usually abetted by Robin and sometimes Jimmy Olsen, too). 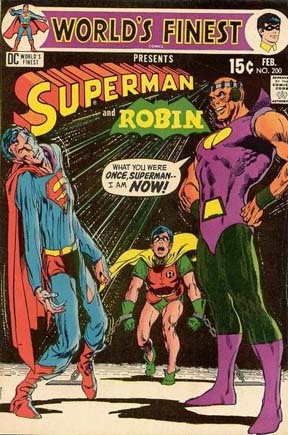 In 1970, the comic ditched Batman and teamed Superman with a different DC hero in every issue. The stories in WF rarely lived up to the dynamic covers, however. Here’s the covers to World’s Finest #200 (Feb. 1971) and #203 (June 1971) both by Neal Adams (my first favorite artist).